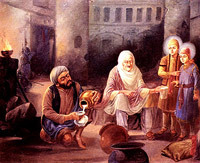 Baba Moti Ram Mehra a devoted disciple and selfless servant of the Guru Gobind Singh, disregarding the risk to his own life, managed to enter the Thanda Burj in a very dramatic manner and served milk to the Mata Gujri and Baba Zorawar Singh and Baba Fateh Singh, two younger Sahibzadas (sons) of Guru Gobind Singh for three nights, where they were kept under arrest byMughal Governor of Sirhind, Wazir Khan. 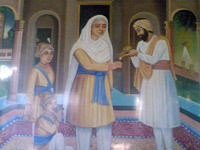 On December 27, the Sahibzadas were martyred and Mata Gujri also died. He also arranged sandal wood for their cremation. Someone told the Nawab that his servant had served those prisoners with milk and water. The Nawab ordered the arrest of Baba Moti Ram Mehra and his mother, wife and a little son. He did not conceal his act and boldly told the Nawab that it was his pious duty to serve the imprisoned children and their grandmother. Hence Baba Moti Ram Mehra, along with his family, was sentenced to death by being squeezed in a Kohlu (oil press). His sacrifice was first sermonized by Baba Banda Singh Bahadur.